Here we're going to fix dynamic lights so that they will correctly apply to moving brush models. This can be seen all over Quake, but a good example is the first secret in e1m4. After the shaft doors open and you kill the wizard, give yourself the rocket launcher and shoot it up at the platform. It's lit properly. Now shoot the two switches to lower the platform and jump to the bottom of the shaft. Shoot a few weapons to get the muzzleflash, and the platform isn't lit. That's because dynamic lights take no account of differences in entity positions; they're always at the origin so far as lights are concerned. This isn't the best way to fix it. I'm well aware of that. I am however showing this way so that it can be used as a baseline for doing it right. Also, it involves much fewer code modifications so it's easier to demonstrate what's needed without needing an overhaul of other parts of the engine first. It's expected that any serious implementation will do it better (e.g. by generalizing R_PushDlights and by properly calculating the inverse matrix in software). COOL!!!!! I'll try to try this in software. I'm not entirely certain I've got it right myself (in particular the inverse part) - the code was originally written for an engine where nice helper functions to do this kind of thing were available. Since the original Quake didn't have rotating bmodels this will be fine. SuperCool! So, if I understood correctly, if I use Ode, I could make a swinging lamp which castes real time shadows(like far cry did in a map)? toneddu2000 wrote: SuperCool! So, if I understood correctly, if I use Ode, I could make a swinging lamp which castes real time shadows(like far cry did in a map)? No this is making original Quake's existing feature work right. In MH's first post he provides an example. 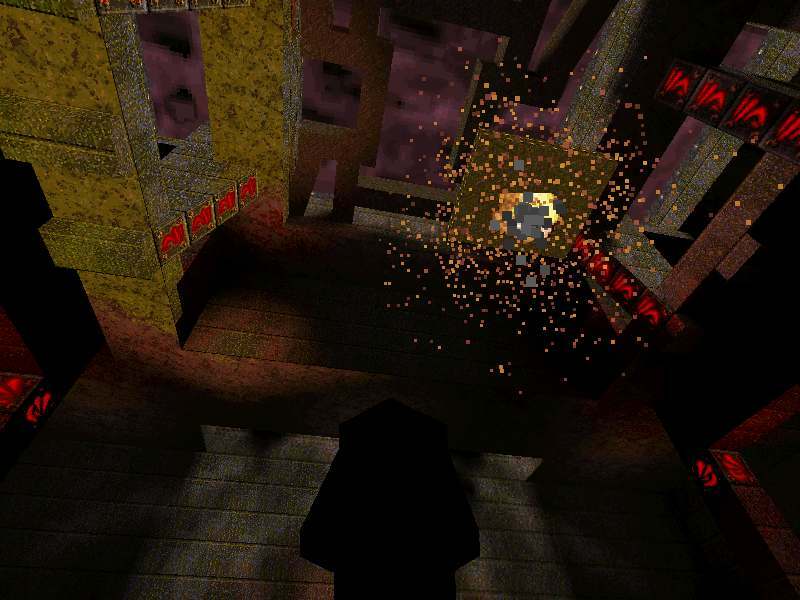 Examples of dynamic light in Quake (WinQuake and GL) is the illumination of firing a rocket and as the rocket moves the area under the rocket is lit up on the surface of the floor. On moving brush models --- a brush model is a door ... essentially anything that is part of a map --- Quake doesn't treat them properly (in a great many ways, really). I've been looking over the software Quake source and it seems that further work is needed for this. The problem here is that the "transformed" member will go out of step - it's necessary to retransform again during the surface cache building stages, for both entities and for the world. Baker wrote: No this is making original Quake's existing feature work right. In MH's first post he provides an example. Ah,ok, thanks. Sorry for my unmotivated enthusiasm! Did you try r_shadows 1, or r_shadows 2? Also, r_shadow_shadowmapping (1 or 2) depending on your Darkplaces build. there's some tenebrae extension that allows you to attach proper realtime lights to entities, but you might need stuff like MOVETYPE_FOLLOW if its a bsp entity. Thanks Spike! I'll try it and post results in another thread not to spoil this one! Thanks for bringing this up mh. Now I understand why Quake never had big moving trains, or really complex sets of moving BSP entities. I just figured out how to implement this in Makaqu, and here's a copy-paste tutorial. Actually, the main problem with the BSP renderer, at least in software, is that it does not care much about entities, and do much of the work by blindly navigating through the BSP tree. As you can see, I had to set currententity in R_PushDlights because it wasn't set prior to that. mankrip wrote: I just figured out how to implement this in Makaqu, and here's a copy-paste tutorial. I just applied it to Engoo's shadows!